WARS have been fought for it, in the third world families walk miles everyday for it, we cannot survive without it. It is that most vital substance for life, water. As the world faces an ever-increasing demand for an ever-decreasing supply, Zaragoza has chosen water as the theme when it hosts the next International Exhibition in 2008. The subject is quite an appropriate one for a city in the second driest part of Spain, where the newspapers are filled daily with reports of the sequía (drought) and show pictures of ancient villages once flooded to make reservoirs being eerily uncovered again as water levels plummet. The reason for Zaragoza’s location is not difficult to find. The enormous River Ebro is the lifeblood of Aragón and, rather ironically, has the highest volume or caudal of the rivers in Spain while passing through one of the driest parts of the country. The Iberians were the first to settle here in Neolithic times followed by the Romans who took over the Iberian settlement of Salduie in 14BC founding their own town which they named Caesaraugusta after the Emperor. The Muslims called it Saraqusta and the name has since become the present day derivation, Zaragoza. References to the city’s Roman heritage can still be seen today in names like Calle Caesar Augusta where a statue of the Roman Emperorstands nobly in front of the remains of the Roman walls and the recently uncovered Roman theatre is also now open to the public. By the time the Moors were making their way across Spain, in the eighth century, Zaragoza was still a thriving city, although less so than in Roman times. The Moors ruled the city from 714 to 1118 and left their mark, which is still very strong today. At every turn you can see the typical mudéjar style buildings with thin bricks and beautiful mosaic decoration. Mudéjar is a combination of Islamic and European architecture and Zaragoza’s Aljafería palace, now the seat of the Aragonese parliament, is a splendid example of the style. Having been taken by the Moors, the city defended itself against Charlemagne and again withstood sieges by Napoleon in 1808-1809. Zaragoza also played a large part in events leading up to the Civil War; the archbishop was murdered in 1923 by anarchists and a great general strike in 1933-34 amazed observers as workers went unpaid for 57 days. But the city was taken by surprise when the Fascists attacked and despite a strong effort, the Republicans were never able to regain the city. Daily low-cost flights with Ryanair make Zaragoza an appealing destination and whether your aim is to party into the small hours, do some shopping or check out the city before the Expo hoards arrive, a look round Zaragoza’s main tourist sights is a must. A good place to begin is at the ZudaTower, not only because the Tourist Office is on the ground floor but the building has great views of the city and is a good point of orientation before you start. From here head towards the Plaza del Pilar where the four-towered baroque Basílica de Nuestra Señora del Pilar towers majestically above the city and can be seen from all around. The building was started in 1681 and houses frescos by Goya in the cupolas of the ceiling. Legend has it that following the death of Jesus, the apostle James, later Saint James or Sant Iago, was travelling throughout the peninsula, spreading the word, eventually ending his journey in Compostela. He stopped during his travels in Zaragoza and while praying in the city the Virgin Mary appeared to him on a jade pillar and requested that he build a shrine on that very spot. Then, as quickly as she had come she disappeared leaving nothing but the pillar on which she had stood. As commanded James set about completing his task and a church was built. The sight is now the location of the Basilica de Nuestra Señora del Pilar (Church of our Lady of the Pillar) and to this day the building houses the jade pillar which pilgrims come to catch a glimpse of. Across Plaza del Pilar is the rather more modest La Seo cathedral. Built between the 12thand 18thcenturies on the site of the city’s mosque, the San Salvador Cathedral is a mix of styles, from Romanesque to Neo-Classical, with a touch of Mudéjar, Gothic and Baroque along the way. Continue into the Casco Viejo to explore the maze of small streets and take in among other things the Roman Baths, the Caesar Augusta Forum Museum and the first century Caesar Augusta Theatre. As Spain’s fifth city, with a population of 650,000, visitors might expect Zaragoza to be unfriendly and inhospitable, but not a bit of it. With the move away from agriculture towards industry that began in the 1960s thousands of people throughout Aragón moved to the capital in search of work. More than half the population of the region now lives there. But since many residents in Zaragoza grew up in the countryside the city sometimes has the feel of a village. Many people still retain links with their pueblo and at weekends traffic pours out of the city as they head for the calm of the countryside. Zaragoza’s location, almost equidistant between the main cities of Madrid, Barcelona, Bilbao and Valencia, as well as its good road and high speed train links, make it an ideal centre for distribution. A new industrial zone, Pla-Za, has been established and is the European distribution base for companies such as the Spanish clothes chain Zara. Car manufacturing is one of the main industries here and the Opel factory employs 9,000 workers directly plus providing numerous jobs in associated industries. Like any large Spanish city Zaragoza has a thriving nightlife which can be found mainly round the old town (Casco Viejo) in the area known as El Tubo (the Tube) because of the narrow streets, although the area near the university is also pretty lively. Most tastes in music are catered for, from hip-hop to classic jazz. Being a regional centre Zaragoza is also great for shopping. As well as the well-known Spanish chains like Mango, Zara and El Corte Inglés the city has lots of small individual shops and boutiques where shopaholics can find that something unique. Having beaten off rivals from Trieste, in Italy and Thesalonika, in Greece, it’s full steam ahead as Zaragoza prepares to welcome participants from 83 countries and an estimated 3.2 million visitors to the Expo in 2008. But Spain is no stranger to hosting such large international events and can draw on its experience of the Seville Expo and Barcelona Olympics both of which it hosted in 1992. The timing is particularly poignant as it falls during the centenary of the Spanish-French Exposition of 1908 and the bicentenary of the sieges of Zaragoza in 1808 by Napoleon’s troops. Preparations include the building of an Expo Village to house 2,500 of the participants, an Expo City with facilities for 5,000 visitors, as well as new hotel accommodation. In terms of transport a third ring-road is planned, two basic metro lines have been designed and the Expo site, on the Meandro de Ranillas (a meander of the Ebro, northwest of the city) will be reached by cable car and a river transport system. A dam will be built to stabilize the water level of the Ebro and there will also be footpaths linking the city with the Exhibition site along both sides of the river. The chosen theme of Water and Sustainable Development will offer an opportunity for the participants and visitors from around the world to interchange ideas on their experiences, problems and solutions for managing water. The conclusions of the debates, contributions from visitors and the main contents of the Exhibition will be gathered together in a manifesto known as the Zaragoza Declaration. The average ticket price will be €18 and it is estimated the Expo will cost €245 million, the funds coming from a combination of public and private investment. Overall it is expected that it will make a profit and €13.6 million of the expenses have been earmarked for direct aid to participants from developing countries. The Fiesta de la Virgen del Pilar is celebrated in the second week of October and begins with the Pregon, the announcement of the opening of the festivities, in the vast Plaza del Pilar. During the week-long fiesta the plaza hosts offerings of flowers to the virgin and performances of jotas, Aragonese folk dances, and music. But the celebrations take place throughout the city, including live music performances and fairs in some squares in the old quarter, classical music concerts, daily performances in the municipal big top marquee in Plaza de los Sitios, exhibitions in La Lonja, boat rides, balloon rides and short plane rides, a traditional trade fair and bull-fights in honour of the Virgin. El Pilar, a national holiday, is celebrated on 12 October and Pilar remains a very popular name for girls not just in Aragón but throughout Spain. 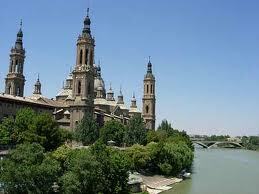 ZARAGOZA, a place to invest? While property prices in Spain appear to be stabilizing after the boom of the past five or six years, in Zaragoza the increase has continued since the news that the city is to host the Expo in 2008. Santiago Muñoz, director of Don Piso Ferrovial, Zaragoza explains: “This year prices have maintained an increase of 18% while in the rest of Spain that figure is around 10 or 12%. The banks have commented that they expect prices to continue rising by more than the Spanish average until the Expo. Not by 17 or 18% but by about 15%. Is there much new building work going on? How would you sum-up Zaragoza’s property market? “Zaragoza is a slightly peculiar city in terms of property prices in that there are no great differences in price between the suburbs. Of course in the centre prices may be €4,500/m squared but on the outskirts different areas are much the same. There are no bad areas where you can buy cheaper apartments.